If you've read my last week's financial lesson blog post entitled All About Sweldo in the Philippines then you might have an idea on my do's and don'ts towards the end. Thank you for making it one of the most viewed post of SavingsPinay. Anyhow, today I will teach how you could turn your salary into a potential income. Now you might be asking what's the difference between the two. Your salary is the money you get out of working for a regular basis while income is the total accumulated money you can generate out of the many resources you have including your salary. OK, let me elaborate more. I, for example gets a monthly salary out of my office job. However my monthly income includes my salary, my freelance writing payments, my blog income and my events. With all modesty aside, just my salary alone, I believe I can manage. I am single and with my parents as my sole dependency. I am fortunate too to have parents that prepared for their life well. But then I maximize my salary and slowly turned it into income. And not just one source of income but multiple streams. 1, I was able to try investing at a young age. I know 21 is still too old for an investor nowadays but still… without that assurance on my multiple income resources I won't even try the world of investing. 2. My savings doubled in just a short span of time. I was able to come up with 3 Envelopes such as a Financial Goal Fund, Fun Fund and Emergency Fund. 3. Manage to stay out of debt. I am proud of being debt-free since birth. I guess that's another reason why I have a positive net worth… because I stay out of liabilities and try harder to just invest on more assets. Turning your salary into income is no magic. All it takes is awareness. Yes I've discussed how the big word A-W-A-R-E-N-E-S-S will make you better in your finances. You can read it all in this link: The Ultimate Secret to Save Money. Now that you are aware of the current situation you will have a better motivation to move on and take a stand. Here are the follow up steps that could turn your salary into income. Save. From the first salary that you could ever receive in your entire career life…start saving. The goal is to make saving as a habit of yours. Make it automatic if possible so there will be no reason for you to forget your savings. Find your talent or skill. I know that this step is easy said than done but I have my full belief that we are created with our own gifts from God. There will as always one thing that could make us unique. I have found mine in the field of hosting and used that to create additional income. Manage your Time. You may not notice it but a person who manages his/her time well has a definite advantage in managing their finances. Remember that what you earn in your salary depends on the time you have spent on the work this means that if you fail to manage your time well, you could possibly have much lesser salary. Another example is how my life is before I had sorted my time through My Ideal Week. I wake up late that led me to go to work late too. Not only that there were times when I was forced to take a taxi or habal-habal just to keep up with my time. Imagine how much money I've wasted over the months of being irresponsible with my time. Take a risk. If you have a talent, earn from it, if you have an idea, develop it, if you have extra savings then invest it. Take a risk in your money and let it grow. Always think out of the box and become much better in handling your many resources. Believe in Yourself. You have the mighty power to control your life in accordance to God's plan. Choose to be the better version of yourself every day. Believe that everything is possible and that everything has its season and reason. I hope that this post convinced you that there is still a hope to turn your salary into income. The only limit in life is your creativity and how much you are willing to persevere. 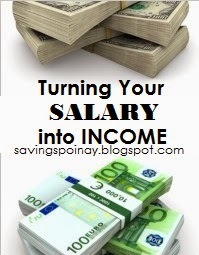 Are you ready to turn your salary into income? !